It’s no surprise a college degree — whether two-year, four-year or postgraduate — can lead to a brighter future. It’s also not news that getting a degree can be expensive, or that student loan debt can hamper the future finances of graduates. So where should students turn if they want to make ends meet without adding a huge loan bill to their degree? There are plenty of options, including federal and state grants, work-study funds and aid from your college. For millions of students, there are also scholarships — over $50 billion worth were given out last year alone in the United States. The money is out there, and, whether you’re a junior in high school or an aspiring law student, now is the time to start searching for it. 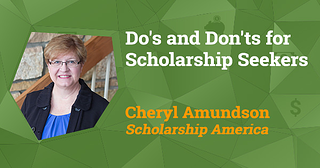 To give you some guidance as you jump in, we’re happy to offer expert advice from Scholarship America’s Cheryl Amundson. Cheryl has been with Scholarship America for more than 10 years as the manager of a college readiness program and a custom scholarship designer. She has also taught in middle schools, high schools and colleges — and helped three children of her own earn their degrees with minimal debt. Here’s her advice about what to do (and what not to do) as you think about scholarships. Part 2 of this series will be posted next week, so stay tuned! There’s an old proverb that says “Look back to where you have been, for a clue to where you are going.” For scholarship seekers, this is incredibly valuable advice. No matter how unique they are, most scholarship applications will ask for a lot of the same information, and having it ready and polished will save you a ton of time. To get started, take a day or a weekend and do a “self-inventory.” Pick a place that’s convenient and secure — your phone, your laptop, or even a paper file in a cabinet — and gather basic information about yourself and what you do. List your GPA (transcript), school and community activities, leadership positions, honors and awards, work experience, volunteer service, special interests, references, standardized test scores and any FAFSA or other financial need data you have available. These questions and answers will be useful for nearly every scholarship application, and setting aside time to gather and update it regularly will mean far less pressure to get everything together for a deadline. This is also a perfect time to think about ways to boost your resume. Is your “volunteering” section shorter than the rest? Make a note to check out volunteer opportunities in your community. Do you have a ton of activities but a lower GPA than you’d like? Consider taking some time off to focus on your studies. In addition to preparing you for applications, your self-inventory can help you look at your resume like a scholarship evaluator would! Not many scholarship programs are open for applications during the summer — but it’s the best time to start your search. During the school year, you’re under plenty of pressure. There are classes, homework, tests, activities and a million other things to do, and that means less time to search for scholarships. Your summer might be busy too, but it’s much easier to find a couple hours a week to devote to your scholarship search. By familiarizing yourself with the world of scholarships now, you’ll be a step ahead when applications start opening. Your search will probably start online, with one of many search engines, scholarship databases and matching apps. 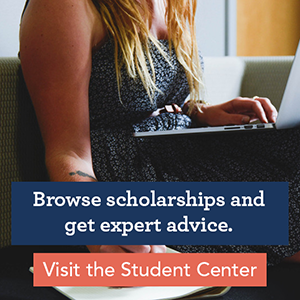 (Among those we recommend: Fastweb, Cappex, Unigo, Student Scholarship Search, Scholarships.com, Sallie Mae, Big Future (College Board), Scholly and Good Call to name a few.) You’ll find a wide array of scholarships this way — but the search engines won’t list everything. To ensure you’re not missing out, it’s important to look within your community. Turn to your parents, friends, teachers, coworkers and mentors, all of whom may know about local, targeted scholarship opportunities. Explore the community organizations in your city: both nonprofits and local businesses frequently provide scholarships. If you’re already in college, find out what’s available through your school, department and your extracurricular activities. Churches, fraternities, sororities and clubs are almost always a good source of scholarships. Look locally; look nationally. And remember: starting early is ideal, but there’s never a bad time to search for scholarships. Deadlines rotate throughout the year, and there’s always something new to find. Getting organized and planning out your search are half the battle. Watch for Part 2 next week, where we’ll look at focusing your search and maximizing your return on investment — plus the top ten things to avoid while searching for scholarships.